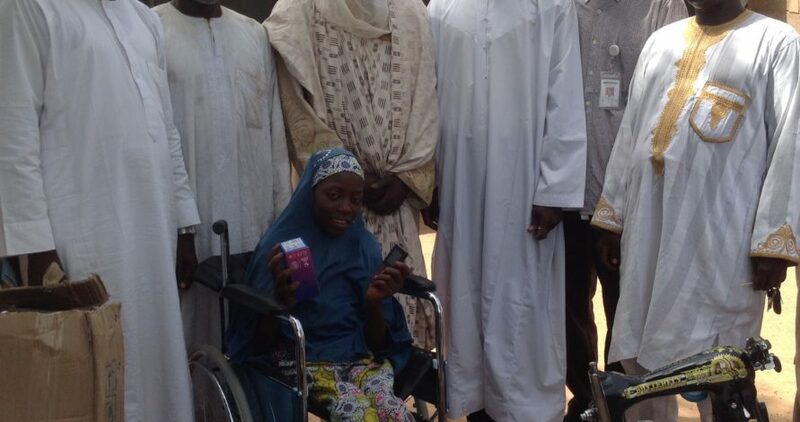 14-year-old Naima Hamza, a physically-challenged girl in Jigawa, who wept on Saturday for not being among beneficiaries of wheel-chairs donated by the NYSC, now has two wheel-chairs. 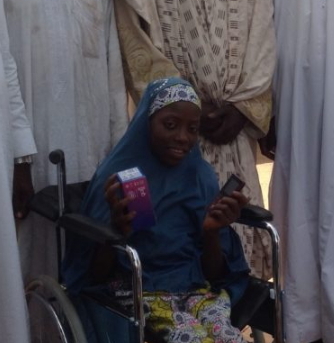 NAN reports that apart from the wheel-chair donated to her Monday by the NYSC Director-General, Brig-Gen. Suleiman Kazaure in response to her emotional reaction, a philanthropist in Hadejia, Jigawa, on Wednesday gave her another one. The philanthropist, who sent the items to her by proxy and pleaded to remain anonymous, also donated a cell phone and three sewing machines to the girl, a cripple, just as he pledged to sponsor her education. In addition, the donor directed his representatives, Mr Baba Sani and Mr Ali Sule, to rent a shop for the girl where she would conduct business. “The man said we should never mention his name because he did it because he wanted to impact positively on the life of the girl. “He said that a report on her emotional reaction made him to assist her. “He also directed that the girl be enrolled in school immediately, pledging to sponsor her education. “For these three sewing machines, as you can see one is handy which she can operate with her hands. “And for the other two sewing machines, he said two of Hamza’s relatives should use them to learn how to sew along with her. The philanthropists, who sent in three wheel-chairs, directed that the remaining two be given to other physically challenged persons in the area. Commenting, the District Head of Shuwarin,Alhaji Abubakar Abdullahi, in whose palace the items were presented to the girl, commended the donor for the gesture. In her remark, Hamza, who was visibly highly elated, thanked the donor for coming to her aid, promising to use the items judiciously. Also speaking, father of the beneficiary, Malam Hamza Muhammad, thanked the philanthropist for pledging to sponsor the education of his daughter. Also her mother, Mrs Rakiya Hamza, said the sewing machines would empower the family economically. NYSC Coordinator in Jigawa, Mr Michael Amulo, who also witnessed the presentation of the items, commended the donor. It would be recalled that Hamza had wept, upon realizing that her name was not in the list of beneficiaries of wheel-chairs donated by NYSC to some physically-challenged persons at a ceremony in Shuwarin on Saturday. Her emotional response, which was given wide publicity by the media, prompted the D-G of NYSC, Gen. Kazaure, and some individuals to come to her aid. God is ever faithful. He who laugh last laugh best. May God enrich your pocket, the good Samaritan. You will never lack. So happy for you geh. NGO, NOW THAT WE KNOW HER NAME, PLEASE STOP REFERRING TO HER AS “THE WEEPING CRIPPLE GIRL” I THINK “BEUTIFUL SMILLING NAIMA” WILL BE MORE APPROPRIATE. Some disappointments are blessings indeed….weep no more,God has wiped your tears. Let not those Mallam go and impregnate her now.. Thanks to God Almighty and the man, the girl is nobody to somebody. God is great. May God almighty bless d cheerful giver abundantly.